The first time I got a glimpse of, Boss Caine I was completely taken off guard. The music is so passionate and the melodies grab you in the best of ways. As soon as I heard him play live, supporting Shooter Jennings, I immediately bought all of the music that was available and ever since I have been waiting for new music. So I guess you can call me somewhat of a fan. Finally after what has felt like a long wait, we now have the new album Loved by Trouble, Troubled by Love and it is excellent. For me it boils down everything in the the essence of country music. The emotion on display that really sells this album. 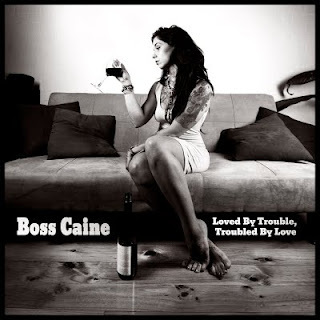 Boss Caine is able to deliver an album that tells stories of joy and sorrow, levity and depression and it’s all bundled in a wonderful package. I have been looking forward to this album for the longest of time so I was really excited to get my hands on these songs. The album opens on a high note with the fun tune Champagne which has a really big band feel to it and is a great way to open the album with that good feel good tune with a very catchy chorus. Even though the album does have those nice fun tunes, it’s in the soft songs that Boss Caine show their strengths. The album has a real heart when it comes to the melancholic and emotionally charged music. The soft acoustic and the folk instrumentation create a really nice atmosphere that leaves you mind space to wonder. To counterbalance the soft music, you have the vocals of the man himself, Daniel Lucas, which are rough and raw. Trust me, no Nashville style auto-tuning going on here! His voice is very earnest and very real, giving the music that grounded feel to it. The production on the whole is wonderful. Everything sounds balanced out and the tone is is rich with all of the musical elements blending so well together. It’s hard to say whether I like the upbeat tunes or the soft ballads more, it’s all done so well. The song-writing is superb. A good song is one that has a narrative or something to say. Which Boss Caine has in droves. Boss Caine feels like he’s coming from the everyman perspective. Anyone can feel these emotions or relate to what is going on in any of the songs. Like the title track Loved By Trouble (which features the lovely vocals of Edwina Hayes) or the beautiful tune Better Ways to Get Free. This is the real strength of their music. It’s very reminiscent of Kris Kristofferson or Mel McDaniels. Giving you scenarios and stories of life and trying to get through it the best way you can. Genuinely another great record, I know music like this isn’t for everyone but I think everyone should give Boss Caine a chance. Beautifully composed music and lyrics that cut right to the bone of life.